Cannabis and the arts have always gone hand in hand, so it’s no surprise that some of the best jobs in the legal weed industry are also some of the top marijuana jobs for artists. Creatives of every creed are needed to rebrand the cannabusiness and elevate it to new heights. While most of the open positions in this business are for work in dispensaries and in production facilities, it’s refreshing how many opportunities cannabis creates for artists. If you’re a dedicated stoner, odds are you’ve procured a prized pipe or bong over the years that’s been with you through many fortnights. 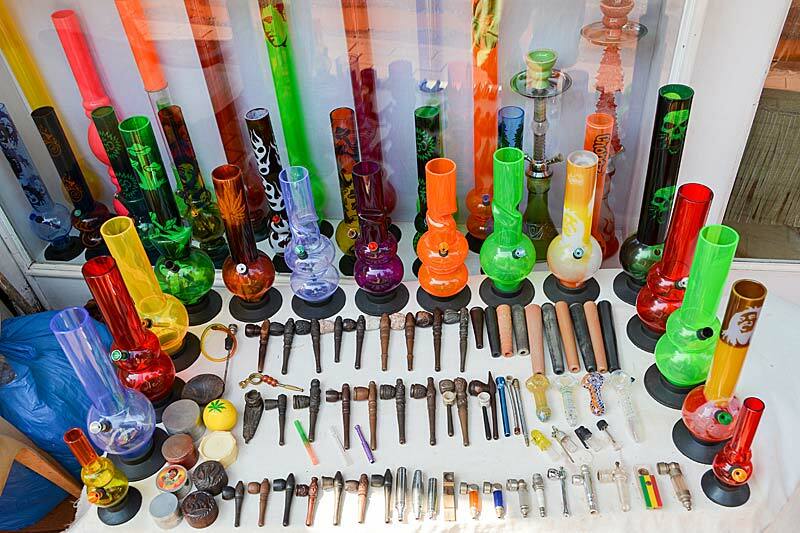 While years of glass pipe production has featured largely sturdy utilitarian varieties, glass blowers and cannabis lovers are upping the ante. Perform a quick search online and you will discover just how high the quality of glass art can be. Paraphernalia isn’t just to facilitate weed smoking anymore. Especially now that more states allow for legal sales and use, consumers are purchasing aesthetically pleasing glassware to feature as both a vessel and a centerpiece to their living space. Qualifications to work as a glass blower obviously involve learning and honing the craft before sustaining these top marijuana jobs for artists. Some individuals actually obtain Bachelor and/or advanced degrees in glass blowing. In many cases, interdisciplinary artists and craftspeople pick up the trade and catch the bug. In addition to being a beautiful skill to have with a satisfying final product, it can also be a lucrative career! Some glass artists charge hundreds, even thousands for their original designs. Even in the case of more inexpensive alternatives, art collectives and cannabis dispensaries can feature the work of a diverse range of artists. Indeed, legal dispensaries have given more exposure to high quality glass designs. By far, one of the top marijuana jobs for artists is in the field of graphic design. Perhaps every sector of the cannabusiness requires an advertising and brand platform, such as a website in order to stay in business. While some companies task unspecialized employees with designing online and print platforms, most companies contract or staff a graphic designer. Hiring graphic designers ensures a greater chance of a polished final product. Marijuana graphic design jobs are a dual position with artistic and technical aspects. In fact, graphic design can be broken down into different subcategories and fields of specialization. Some jobs require designers to create logos, others involve website design, while others still are focused on motion graphics. In general, graphic design is one of the few partly artistic jobs experiencing income growth. As many artists know all too well, it can be an excruciating process finding a job, and even harder still finding one that pays well! Graphic designers aren’t just called upon for their potential in online marketing, they are also needed to design packaging imagery for cannabusiness products and paraphernalia. Working top marijuana jobs for artists in graphic design doesn’t maintain set standards for applicant credentials. Some designers have degrees, while others have experience from years of freelance and/or agency work. Every artist has a muse – in the case of cannabis photographers, the gorgeous green plant provides a worthy subject for artistic exploration. Most anyone who has access to cannabis can document it digitally, but it takes a skilled hand to really capture the plant’s essence in detail. Photographers are hired for a variety of jobs. Some photograph cannabis flowers up close to detail the minutiae of each breed. Other photographers shoot for stock photo sites or freelance for marketing agencies. Whatever the case in, photographers have to be well-versed in the parts and processes of pot in order to find consistent work. There’s no doubt that marijuana photography jobs are some of the top marijuana jobs for artists, it doesn’t always provide full time work or consistent wages. Photography falls mainly into the category of freelance marijuana jobs and is great for those who like to travel or work remotely. Although this list of top marijuana jobs for artists does not appear in any particular order, it’s quite possible that the individuals who roll smokeable cannabis art have the best job of the bunch. Joint artists are commissioned to roll original pieces chock full of bud. Finished products can be simple and regular sized, as well as multiple story weed structures weighing multiple ounces. The advent of this kind of extravagant joint art took off on platforms like Instagram which allows for the rest of the world to view their creations. How much does it cost to purchase an original piece? It’s hard to say, since there are few individuals making money doing this full time. WIth that said, the ones who are can fully support themselves on this venture alone – pretty impressive! In the last few years, more grassroots and national joint art competitions have come out of the woodwork to boost the acceptance of this lighthearted form of creative expression. Cannabis reviewers started off as a particularly small bunch up until recreational legalization broke. Yet in just the few years since, more publications are featuring strain critics and other cannabis product reviews to draw in consumers and feature the creative voice of the plant’s most passionate writers. Working as a strain reviewer is a great chance to develop your journalistic and literary clout (not to mention your pothead palate)! Critics write on all aspects of the smoking experience, just as a wine reviewer would his Cabernet. Every writer formulates their review in under different methods, though all strain critics focus on similar criteria. In this new age of cannabis consumption, customers are nearly as concerned about the aesthetic of the flowers than they are about the taste or high. Nevertheless, critics give a full breakdown of the color, resin-content and feel of the crystally buds before addressing smell and taste. Aroma is a formative element that marijuana critic jobs focuses on. Dispensaries allow for customers to smell flower options, making it important that the strain features a distinct scent. From here on, the reviewer smokes their bounty enough to remark on taste, harshness and high. Strain critics are top marijuana jobs for artists and legitimately help in giving well-rounded analyses of different products. While it may seem like a silly job to some, these writers guide new customers through the process of understanding and selecting merchandise from the overwhelming array at their disposal. While not always considered an art, cooking and baking provide some of the most creative top marijuana jobs for artists. Using their refined palates and experience wielding a knife to come up with sweet and savory food and drink items that taste great and pack a punch of THC or CBD. Working as an edibles chef in a busy kitchen is challenging to begin with, but add the extra layering of complying with cannabis regulations and you’ve got yourself a stressful environment! Not for these individuals. They thrive on the precision it takes to execute a great product and keep an even concentration of THC and other cannabinoids. Becoming an edibles chef is not a quick task for most. Most hopefuls will have to gain experience working in kitchens and/or obtaining professional training in cuisine to land high power edibles chef jobs. There are however, some smaller bakeries and shops where self starters build their operations from the ground up. Believe it or not, “cannabis” and “hemp” come from the same genus and species of Cannabis sativa L. The major difference between the two? One produces densely-concentrated and psychoactive flowers, while the other produces superfood seeds and can be used for everything from fuel to making clothes. Yes, hemp clothes are still popular and there’s a reason for it! Hemp is a fibrous plant that contains many essential protein, fats, vitamins and minerals that make it strong. Therefore, it is perfect to harvest as raw material and turn into versatile outfits. Hemp apparel designers create fashionable, ready to wear items that are friendly to the earth and good for human skin and health. This might seem like a bit of a stretch, but hear us out – leading a grow operation is an artistic endeavor. Master growers are responsible for coming up with plans and protocol for growing their crop. This includes everything from installing hydroponic systems to keeping the right concentration of NPK in each plant. Even once it comes time to harvest, there are other creative marijuana jobs that provide opportunities to produce beautiful finished products. Trimming is one such example where workers develop efficient, yet effective methods for trimming harvested cannabis flowers to optimal taste, texture, smoke and effects. The cultivation arena of the cannabusiness offers people the chance to find entry level work as a trimmer or grow assistant, in order to build up their credibility in hopes of working someday as a grow master themselves. The current American administration is not making it easy for artists or cannabis lovers to thrive in our current job market. Luckily, there are many representatives and even more consumers who will fight to uphold our rights as cultivators, manufacturers, distributors, customers and observers of the cannabusiness.